Finding that perfect Valentine’s Day gift for a significant other can be a difficult process, particularly if your budget is suffering from the effects of a recession. Buying that special gift involves all types of factors such as cost, the other person’s interests, and perhaps most importantly, the amount of sentiment the gift conveys. 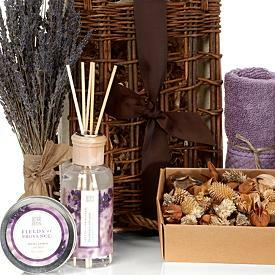 In finding the appropriate gift, considering the stage of a relationship may also be important. Too many people opt simply for a box of chocolates and a card, when a little thought can go a long way in putting a romantic and sincere spin on some “traditional” Valentine’s Day ideas. Expressing love on Valentine’s Day for your sweetie should not leave a bad taste in your mouth after shelling out hundreds of dollar. Remember, it is really the thought that counts. Here are some great ideas under $50 that will not break the bank, but will also leave the object of your affection beaming, knowing that you cared enough to send a thoughtful gift. 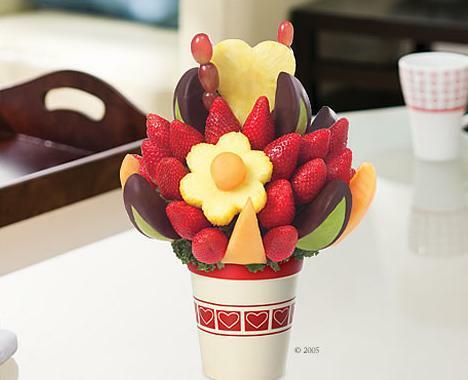 For a twist on the classic bouquet, a gift from Edible Arrangements is a sweet (literally) way to show someone you care. Many of their arrangements come with a vase or container to best showcase the attractive fruit displays. 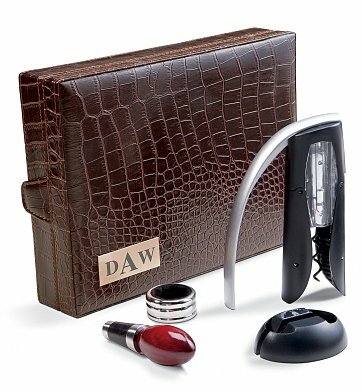 This wine set features a bottle opener, foil cutter, wine collar and stopper, all packed in an elegant leather case with customized monogram engraving. Dinner for two is a romantic affair, and the event can be made more special when done from home. 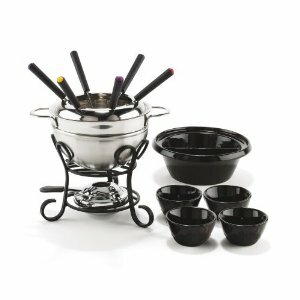 A stainless steel fondue set allows the option of multiple courses with a cheese fondue appetizer, a meat fondue main course, and chocolate fondue for dessert. Made from sterling silver wire and reclaimed glass, these handmade jewelry pieces are eco-friendly and stylish, without the undue pressure sometimes associated with fancy Valentine’s Day jewelry. 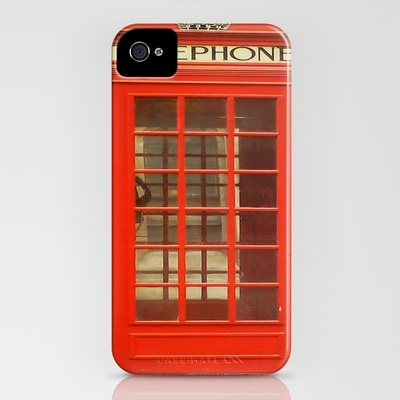 Cases and skins for the iPhone and other products come in countless varieties and are excellent gifts for the young and old. Recognizing a person’s interests and picking a unique case based on that shows a degree of thoughtfulness. Rather than a box of chocolates, chocolate-dipped fruit is decadent without feeling too guilty. 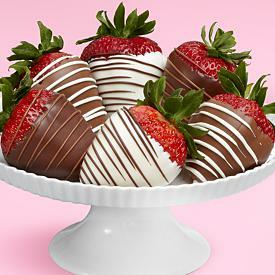 Purchase an artfully-dipped set of strawberries and give a sweet and healthy gift. For another twist on dinner for two, consider a picnic getaway. This picnic backpack has all the necessary essentials, minus the food. Combine the picnic backpack with a trip to a local winery for added romanticism. 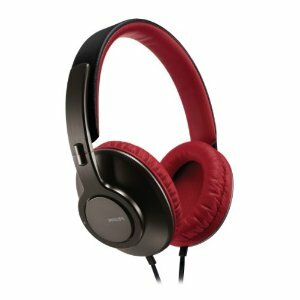 For the music lover or for someone who goes on long business trips, Philips Headband Headphones make an excellent gift choice. They combine functionality and comfort in a design that isolates outside noises for a pure music experience. A Pashmina shawl makes an elegant accessory. With a variety of colors to choose from, it is easy to find one that works for any lovely lady. Both practical and beautiful, the garment can serve as a scarf, wrap or shawl depending on the occasion. Take the stress out of Valentine’s Day with the perfect gift, with no need to take on extra credit card debt. Ultimately, it is about the thought that goes into the gift, not what was paid for it. Considering a person’s interests and tailoring their gift to their personality goes a long way to show the care and effort you have put into the choice. A little thought, beyond the simple box of chocolates or standard bouquet, can make a good Valentine’s Day into a memorable one.